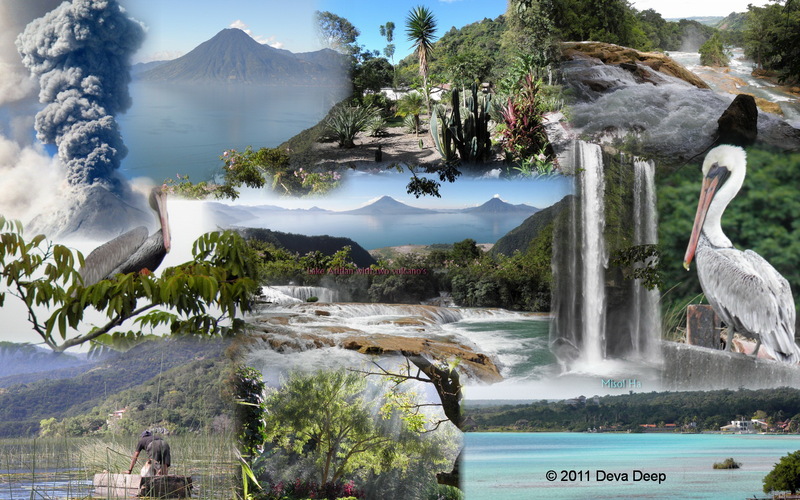 This Central America trip visits Mexico, Guatemala and Honduras. <--- Click on the little map to see the whole route. These countries are rich in nature: beautiful tropical jungles with all kind of wildlife. Hidden in some jungles are magnificent Maya ruins. There are also amazing lakes with volcano's like Lake Atitlan, rivers like the Rio Dulce and majestic waterfalls like Agua Azul and Misol Ha. And not to forget fine beaches with an azure-blue sea and coral riffs. This collage gives an impression of all this natural beauty. You can click on it to see it enlarged. In the slideshow below you can see many more photos. There are several old colonial cities in Mexico and Guatemala, great places to dwell through the old streets and marvel at the splendid churches and other old buildings. The central plaza is mostly very lively with music and restaurants around. Especially in the evening and night you will feel enchanted by the relaxed atmosphere. 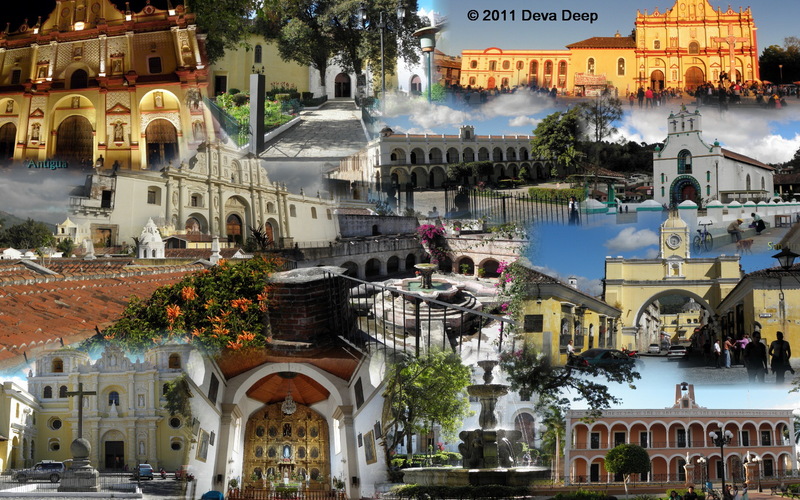 My favourite cities are Campeche, San Cristobal and Antigua. Last but non least the colourful Indian and Mayan people. The today's Mayas have an peculiar blend of Christian beliefs and their old traditions. Like ritual slaughter of chickens in their church, sometimes filled with strange saints and their own folk saint Maximon. 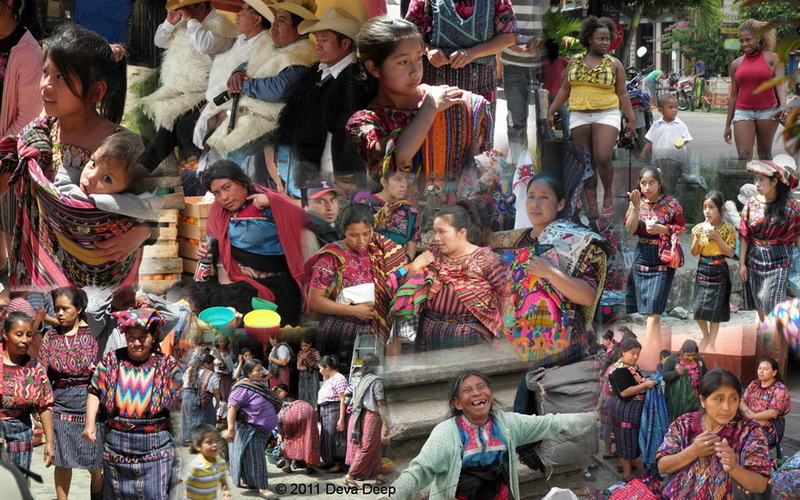 Highlights for me were San Juan and Chichicastenango with their alluring markets..
Again this collage gives a colourful impression and you can see in the 183 photos the whole journey. The Maya is a Mesoamerican civilization, noted for the only known fully developed written language of the pre-Columbian Americas, as well as for its art, architecture, and mathematical and astronomical systems. Initially established during the Pre-Classic period (c. 2000 BC to 250 AD), according to the Mesoamerican chronology, many Maya cities reached their highest state of development during the Classic period (c. 250 to 900 AD), and continued throughout the Post-Classic period until the arrival of the Spanish. The Maya civilization shares many features with other Mesoamerican civilizations due to the high degree of interaction and cultural diffusion that characterized the region. Advances such as writing, epigraphy, and the calendar did not originate with the Maya; however, their civilization fully developed them. 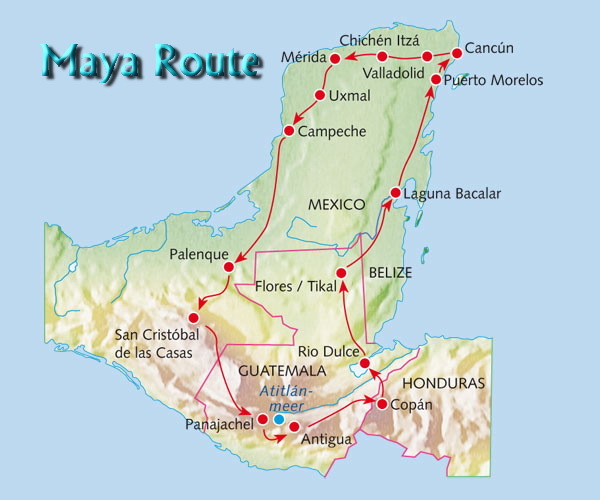 Maya influence can be detected from Honduras, Guatemala, Northern El Salvador and to as far as central Mexico, more than 1,000 km (620 mi) from the Maya area. Many outside influences are found in Maya art and architecture, which are thought to result from trade and cultural exchange rather than direct external conquest. The Maya peoples never disappeared, neither at the time of the Classic period decline nor with the arrival of the Spanish conquistadores and the subsequent Spanish colonization of the Americas. Today, the Maya and their descendants form sizable populations throughout the Maya area and maintain a distinctive set of traditions and beliefs that are the result of the merger of pre-Columbian and post-Conquest ideas and cultures. or the mouse wheel for step by step viewing. Name of the photo is left of the picture. Maya architecture spans many thousands of years; yet, often the most dramatic and easily recognizable as Maya are the stepped pyramids from the Terminal Pre-classic period and beyond. It has been suggested that temples and pyramids were remodeled and rebuilt by a new ruler or for political matters. However, the process of rebuilding on top of old structures is indeed a common one. Most notably, the North Acropolis at Tikal seems to be the sum total of 1,500 years of architectural modifications. Chichen was a large pre-Columbian city built by the Maya civilization. The archaeological site is located in the Mexican state of Yucatán. Uxmal is a large pre-Columbian ruined city of the Maya civilization in the state of Yucatán, Mexico. It is 78 km south of Mérida. Uxmal holds some of the most complex and beautiful examples of the regional Puuc-style architecture, and its magnificent pyramids and structures make it a popular tourist destination. Palenque was a Maya city state in southern Mexico that flourished in the 7th century. The Palenque ruins date back to 100 BC to its fall around 800 AD. After its decline it was absorbed into the jungle, , but has been excavated and restored and is now a famous archaeological site attracting thousands of visitors. Palenque is a medium-sized site, much smaller than such huge sites as Tikal or Copán, but it contains some of the finest architecture, sculpture, roof comb and bas-relief carvings that the Mayas produced. Much of the history of Palenque has been reconstructed from reading the hieroglyphic inscriptions on the many monuments. The most famous ruler of Palenque was Pacal the Great whose tomb has been found and excavated in the Temple of the Inscriptions. Copán is an archaeological site of the Maya civilization located in western Honduras, not far from the border with Guatemala. It was the capital city of a major Classic period kingdom from the 5th to 9th centuries AD. Copán was occupied for more than two thousand years, from the Early Preclassic period right through to the Postclassic. 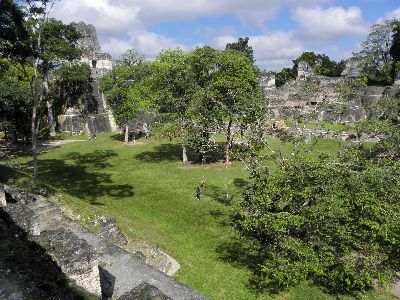 The city developed a distinctive sculptural style within the tradition of the lowland Maya, perhaps to emphasize the Maya ethnicity of the city's rulers. Tikal is one of the largest archaeological sites and urban centers of the pre-Columbian Maya civilization. It is located in what is now northern Guatemala. 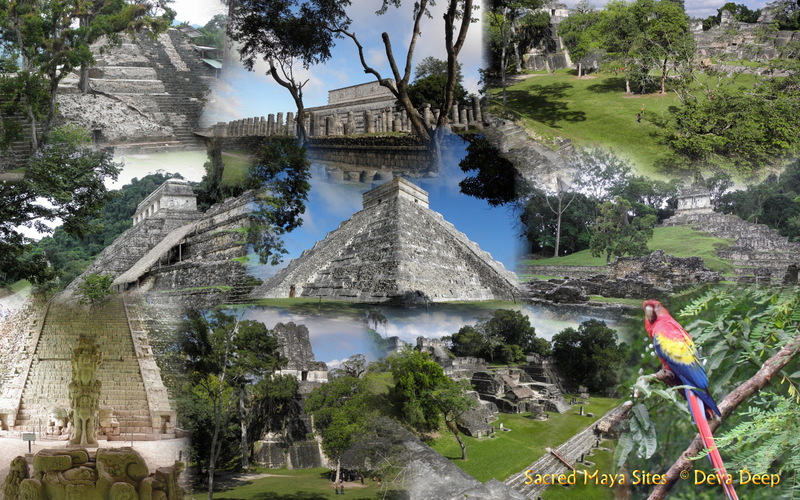 Visiting the sacred Maya sites on very special dates revealed much of the real prophesies for this special time, but also show the principle of synchro-destiny: to be in tune (in synchronicity) with your destiny. It opens the possibilities for a wonderful life.